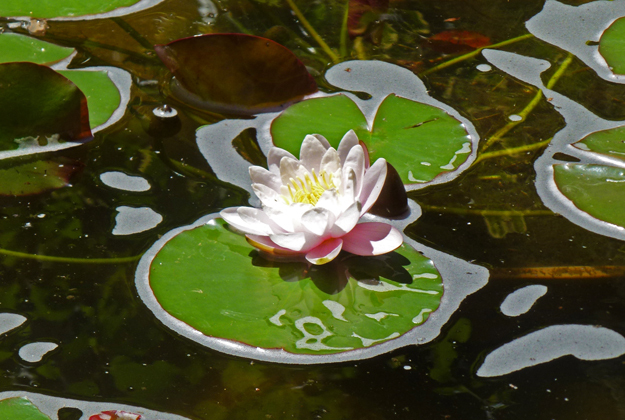 There is something so peaceful about waterlilies. I spotted this one recently and thought all it needed would be a wee frog to be sitting on the leaf beside the flower to be perfect! Lovely, I've been photographing water lilies too. The waterlilies are still with us, too bad frogs have become a rare sight. Muito bonito este belo nenúfar. I think water lillies are cool. Iwas just reading about some in Venezuala this morning. Two meter across! You are so right! I just love looking at them. My Aunt had ponds with waterlilies and I always enjoyed seeing them, and still do. Water lilies are always a treat. It's no wonder that Monet was a little obsessed with them, too. It’s pretty much perfect just as it is! Hello, beautiful waterlily! Have a happy day and new week! You are spot on! Beautiful capture. I need a nice calming photo like that to look at at work lol! You are right, there is indeed something soothing about lily pads. I can't explain what it is.